Dr.Arthur Stuart Huffman was born on the 12th of July, 1909. He was the youngest of 6 children born to his parents, Ai Huffman and the former Margaret McMillan. His siblings included; Anne, Hazel, Jack, Mac and Blake. Dr. Huffman was raised and educated at “Huffman Corners” in Harwich Township. His parents were farmers. 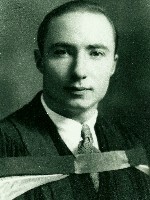 Dr. Huffman graduated from the Blenheim Continuation School (now called Blenheim District High School) before attending The University of Toronto Faculty of Medicine. He graduated on the 10th of June, 1933 and interned for 2 years at Grace Hospital in Toronto. Following his internship, Dr. Huffman practiced at Lambton Mills, (near Toronto) for 6 months before setting up his medical office in Blenheim. He married Mary Isabell Winrow on the 17th of November, 1934 in Toronto, Ontario. Mrs. Huffman was born on the 8th of March, 1910 in Toronto. She was the daughter of Charles Norman Winrow and the former Isabell Redpath. Her father was an electrician and she had a younger brother named Gordon. According to the 1921 census, the Winrow family resided at 429 Marion Street in Toronto. Dr. Huffman enlisted in the R.C.A.F. on the 29th of January, 1943. Dr. Huffman did his initial training at Lachine, Quebec and Esterel Quebec and attended The University of Toronto Faculty of Medicine taking specialized courses in aviation medicine. Dr. Huffman’s theatre of service during World War II was spent in Quebec, Ontario, Nova Scotia and Newfoundland. He was discharged as a Flight Lieutenant on the 14th of December, 1945. After his service to Canada he returned to his medical practice in Blenheim. Dr. and Mrs. Huffman had three children; Annabelle, Bruce and Doris. Mrs. Mary Huffman died on the 15th of September 1953. She was buried at Evergreen Cemetery in Blenheim. Dr. Huffman married Ervine Scherle in 1954. She was born in Isisesti, Romania, the daughter of Johann and Louise Scherle. She immigrated to Canada with her family in 1928. Her siblings were Adele, Elvira, Edna, John, Erna and Frank. Mrs. Huffman had been previously married to Raymond Thomas Vaughan. Mr. Vaughan died of a heart attack in Erieau on the 18th of March, 1953. He was 37 years old at the time of his death and they had no children. Dr. and Mrs. Huffman had two sons, Joseph and Arthur. Dr. Huffman had a family practice at the corner of Parr St. and Talbot St. in Blenheim until his retirement in 1985. Dr. Huffman had many interests, including hockey and baseball. He was the President of the Erieau Athletic Association and enjoyed hunting small game. Dr. Huffman belonged to the Masonic Lodge of Blenheim, the Blenheim Rotary Club and the Sertoma Club of Erieau. Dr. and Mrs. Huffman resided in Erieau. Dr. Huffman died on September 6th, 1991. He was buried at the Evergreen Cemetery. *Dr. Huffman is also featured on the Gathering Our Heroes website.